One of the best ways to have a local experience when visiting a new city is by taking transportation just as the local residents do. In Rio de Janeiro — especially if you’re staying in the Southern Zone of the city — public transportation works quite well and is reliable, but of course, there may be other options you may want to consider, depending where you need to go. Here’s a 101 lesson in getting around Rio de Janeiro, just like the locals do. If you are arriving from Galeão International Airport, the cheapest way to get to the Southern Zone is with bus company Real, also called Frescão. You can check prices and routes on the Galeão website. The other way is to take a taxi. The cheapest ones are those outside the terminal, such as Aerocoop or Aerotaxi (yellow cabs). To Copacabana, for example, it will cost you about BRL 70 (USD 25). Taking a Rádiotáxi inside the terminal will cost you almost double. But remember that the airport is fairly far from the Southern Zone and traffic can be nasty, pushing your journey up to two hours during rush hour. Be aware. The subway is the fastest and safest way to get around the city. One line — the green line — connects Pavuna station (a suburb of Rio) to Botafogo (South Zone), and the other — the orange line — connects Uruguai station (North Zone) to General Osório Square Station (in Ipanema, South Zone). So, if you’re staying in or near the areas of Botafogo, Ipanema, or Copacabana, you can easily go to many places of interest by subway, such as Copacabana and Ipanema beaches, Lapa, Rio’s downtown, and Maracanã Stadium. Don’t worry if you’re not fluent in Portuguese — the information displayed within the subway are in both Portuguese and English. If you’re going to get on a bus, you need to pay attention to the BRS (bus rapid service) system. To make local transit more efficient and less chaotic, the city has adopted a system that separates bus lanes on the streets. There’s a blue line that separates the space reserved for buses. Regular cars are not allowed to drive in these lanes. Because of this system, commuting by bus has improved a lot. Bus lines are divided into BRS numbers and they only stop accordingly: pay attention to the BRS number at the bus stop — only buses holding that number on the windshield will stop there. The easiest and most used method for finding a taxi in Rio is through phone apps, such as Easy Taxi and 99 Taxis. Through them, you can easily find out if there are any taxis around the area near you, and order one. The system is safe, too — you can view the license plate and a photo of the driver before the taxi arrives. Taxis in Rio are among the cheapest in Brazil, making them a good way to explore the city, especially at night (stick to hailing taxis via the apps after dark). 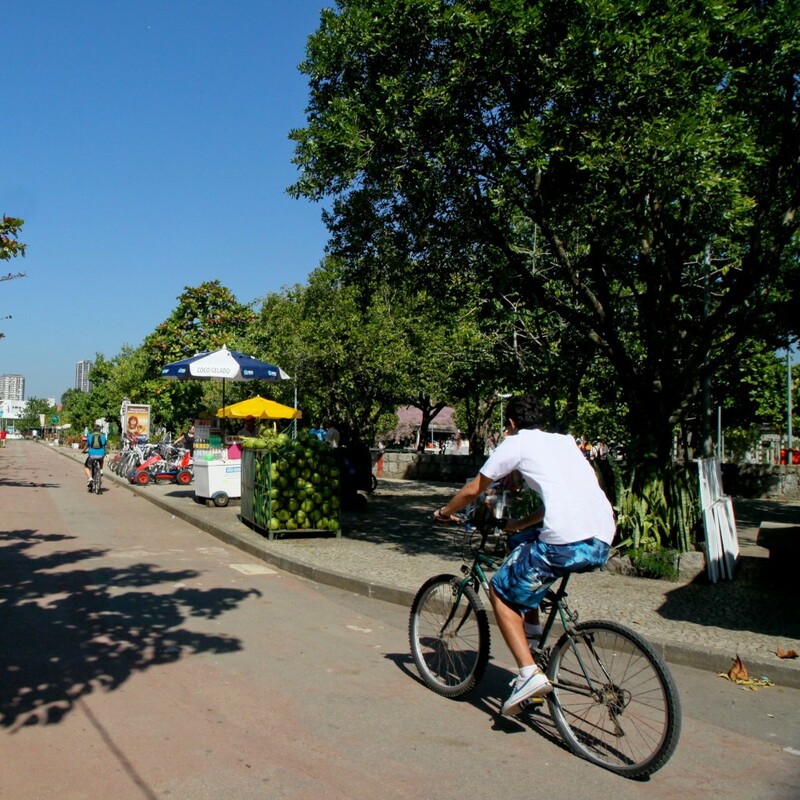 Rio may not have the same bike structure as European cities, but it has the largest number of bike lanes in Latin America. There are bike stations around the city, and you can rent a bicycle with your cell phone — through an app called Bike Rio, you can buy a license that costs approximately BRL 10 (USD 3) for the whole month, so long as you don’t take the bike for more than 60 minutes at a time. Enjoy your ride! If you’re headed to Rio, hop on one of our city tours for a taste of local life! Ive been there an its awesome. Thanks for the memory lane urban adventures.